On Saturday April 3, Members of the C&O were invited by Former US naval officer, Lieutenant Commander Edmond Aruffo (Hughes Hall, Cantab. 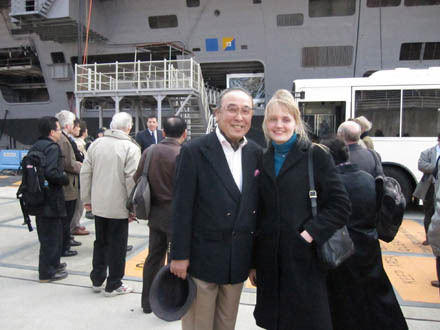 ), for a tour of the nuclear powered aircraft carrier USS George Washington, based at Yokosuka Naval Base. Thirty-three members of the Society attended the tour. 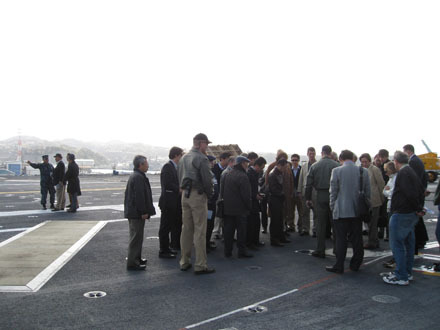 As with the previous tour of the USS Blue Ridge, we were lucky with the weather and enjoyed blue skies and sunshine. After passing through the entry gate, a strong 'listen up!!!!' from Edmond brought the party to attention, and we moved off to board a bus taking us to the ship. We were met by CO Captain Dave "Too Tall" Lausman and XO Dan Grieco, who explained some US military protocol, particularly don’t touch anything, twiddle any knobs or press any buttons. And definitely not the big red ones marked 'Launch'. The ship certainly got everyone’s attention. Enormous, 300 meters long apparently. We went on board the ship and climbed up to the cavernous hanger deck, which was being renovated. Captain Lausman introduced some of his crew, and explained about the design and activities of the ship. George Washington 2010 - Image 3 We then climbed up to the flight deck for a detailed look at all the specialized equipment to launch and land aircraft. We had a run-through of how the steam catapult, jet blast deflector and aircraft brake cables (what are these called?) operated. And we were able to look over a retired Navy Hornet Jet on the deck, which had mysteriously been assigned to XO Dan Grieco. Posted in Event Reports | Members only Submitted by huw.williams on Sat, 2010-04-03 05:00. The list for this event is now closed. Members are invited to an Early Summer Party kindly hosted by the Society’s President and British Ambassador to Japan, Mr David Warren, and Mrs Pamela Warren. Footage of the 2009 Oxford and Cambridge Boat Race will be shown at 20:30. Attendance fee: 5,000 yen per person (payment required in advance; the Society’s bank account details will be sent to those who apply). No-shows will not be refunded. Each member may invite one guest. If you would like to attend, please contact Tim Minton (t.minton[at]camford[dot]org) by May 6th, stating which college/university you attended and providing your telephone and fax numbers. Please note that the number of applications we can accept is limited; early replies are recommended. The Society’s Constitution stipulates that a General Meeting should be held triennially. Members are encouraged to attend this important event in the Society’s programme and to remind themselves of the provisions of the Constitution, which may be viewed on this website. The meeting, to be chaired by the Society's President, Mr David Warren, will be held at The Tokyo Club, starting at 6 p.m. Drinks and a seated dinner will follow. No-show/late cancellation charges will be 8,000 yen, except for those who sign up for the GM only. If you wish to attend, please contact Tim Minton (t.minton[at]camford[dot]org) by Sunday, April 12th. This year's Spring Golf Tournament will be held on Saturday, 28th March at The Hodogaya Country Club (HCC) in Yokohama. Mr Peter Y. Sato and Mr Takashi Uyeno, both HCC members, have kindly made reservations for 6 groups (total 24 players). The tee-off time for the first group is 08:06. If you would like to take part in this tournament, please contact Terry Nakamura (t.nakamura[at]camford.org). Further details will be posted later. If you would like to attend, please let Tim Minton know by Thursday, 11th December (t.minton[at]camford[dot]org). We will have exclusive use of this fashionable restaurant in a secluded part of Minami Aoyama. Payment is required in advance; account details together with directions to Monte Azul will be sent to those who apply to attend. Please note that we can accept only the first 30 applications to attend. No-shows and cancellations after the closing date (Oct. 13) will not be refunded. Despite mixed weather forecasts earlier in the week, Saturday 27th September dawned clear and bright as 11 C&O golfers and guests made their way on the Aqualine under (and over) Tokyo Bay heading for the Society's 2008 Autumn Meeting at Fuji OGM Ichihara GC in Chiba. 2008 Fuji OGM Golf Photo 1 While not the largest of turn-outs for a Society golf event, with some of our stalwarts otherwise engaged on the day, our small group was full of enthusiasm for the return to this pleasant Robert Trent Jones design, which had previously hosted us back in 2005. Among our number, we were pleased to welcome a first time player, and guest of James Lawden, Mari Ohsaki. 2008 Fuji OGM Golf Photo 2 Starting just before 9am, our three groups completed the first half smoothly with the usual golfers' stories being exchanged over lunch of good shots and bad breaks, missed putts and bumpy greens - along with news of two remarkable chip-ins by Takahisa Hashimoto. While inevitably a little different to the roast beef and yorkshire pudding fare of the great traditional clubs of the UK, Fuji Ichihara's lunch offerings were certainly fulsome and a number of our members were noted to be enjoying a late-morning beer or sake to fortify themselves for the second nine. Posted in Event Reports | Members only Submitted by huw.williams on Sat, 2008-09-27 00:00. No-shows and cancellations after the closing date (Sept. 18) will not be refunded. Guests are welcome. If you would like to attend this important event, please contact Tim Minton (t.minton[at]camford[dot]org) by Thursday, September 18th.